Of Mainstream Media: is it dying? Is Mainstream Media dying…. And did The New Media deal it a mortal blow? A sound-bite from Takura Zhangazha whilst speaking on the role The Media on the upcoming Zimbabwean Presidential elections and part of an analysis of previous 2013 elections, at a Medial Alliance of Zimbabwe conference; where it was noted there has been a marked increase in social media usage and citizen journalism. 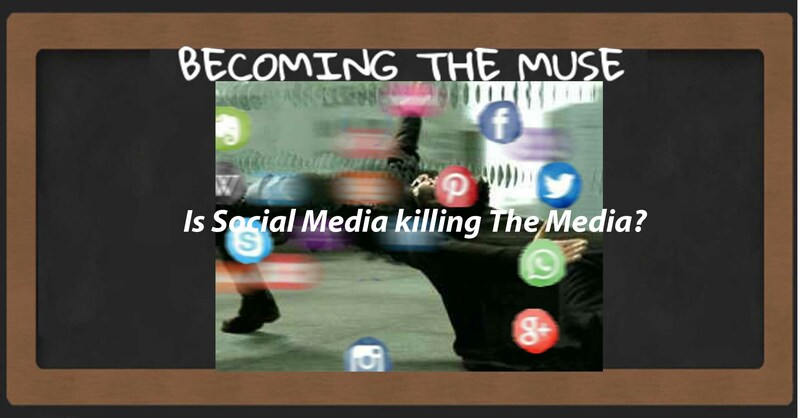 He defined The Medium as being tools, technology; the internet social media…….. If traditional media houses treat new media and online content creation as their “unscrupulous” competition whom they need to fight for their place in the sun then …… mainstream media will die. The logic makes sense; but in this age of The Internet Of Things, where even your fridge can go online; this is how you lose a battle with new media. You leave a space and someone or something will take your place; like a game musical chairs when the music stops, you find your seat has been taken……. You are Out. Piracy/plagiarism is a real problem and another challenge all together. I have Google searched and found snippets of my words unattributed to me, it hurts…. I mean if you ask me nicely I would let you, so long as you referenced back to me, is that too much to ask for? When a solution comes do let me know. Traditional media houses need to adapt and embrace more of the new media; define new guidelines and core values with regards to interacting with social media instead of treating it as an amusing spectacle like children running around in adults clothes pretending to be journalists; useful only to get hits and views. It is an instrument a powerful one, capable of transforming the world as we know it, but a tool’s is utility just like any weapon is dependent on its wielder. The main problem with social media is “the proliferation of fake news” a phrase I have heard over and over again. But it’s mostly a matter of user education, people must need to learn a culture of not spreading unverified information or at least questioning and cross-checking facts. Sometimes even a quick Google Search could prove to you that a celebrity is not dead or how today is a not a unique day whose star alignment will not happen again in the next 456321 million years…..
Maybe that’s what mainstream media has to do; apply expert skill-set to interpret trends, analysing stories and issues raised in new media packaging them in the way they should be, debunking fake news and harnessing the potential reach of online influencers; reviewing new media the way it already reviews traditional publishing houses. On social media everyone to a degree is a social commentator or analyst adding their two cents to the narrative and with elections coming up, that space is going to be real chaotic real fast in a way that could change electoral process dynamics. If I owned a media house……………. Oh, I think this goes way way back, before SOCIAL media came into being. The media has always been a problem with false news. I grew up in the Zimbabwe you mention, when it was Rhodesia. I had family who lived in Scotland – and the number of times we had panic telegrams from them to see if we were safe because they’d heard horror news. (That was before the horror news became a reality!) Good post. Now business taking their adverts directly to social media and influencers taking business away from the media. Thank you for the Recommended Blog of the day!!!!!! !